Although we have not been in touch with the entire membership of the 400+ persons of Kerr Lake Park Watch, the majority of those reached concur that we as a group are in support of the Corps’ adoption of the QRR (Quasi-Run-of-River) Plan. 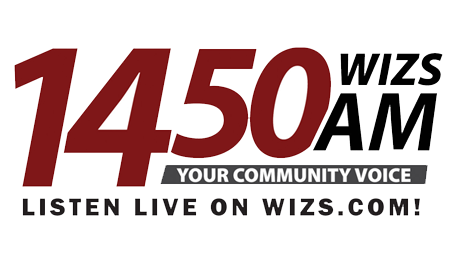 As the Public Affairs Lead, I am requesting that our opinion and comments go into the official comments record. The Roanoke River’s flow has been significantly affected by three dams near the Virginia/North Carolina border. Current dam operations hold large amounts of water in place for unnaturally long periods of time during wet years – causing long periods of flooding, damaging timber, wildlife, and fish. In turn, people who live along the river and depend upon it are also hurt. Since 2000, many conservation stakeholders, resource agencies, local property owners, and other conservation partners have worked with the Corps of Engineers (COE) to improve dam operations at Kerr Reservoir, reducing consequences to people and nature. Today the COE is proposing changing its operations. Improved Conditions in Public Parks & Public Areas – Controlling the flow of the Roanoke River through Kerr Lake using the QRR Plan would help prevent as much water as now that gets onto public parks lands. If water levels did elevate to where it covered public areas, the use of the QRR plan would get that water off faster. Improved Conditions for Public and Private Roads Near Flood Prone Areas – With the QRR Plan in effect, the COE could move flood waters off of public roadways and private areas much faster which has to be a huge factor towards public safety not to mention erosion and the costs of road, bridge and public area repair. Improved Timber Stands – Scientific research shows that continuing current operations, with long periods of flooding, will lead to loss of valuable hardwood trees such as oak and hickory. Over time, the forest will convert to trees with less value on the timber market such as sweet gum and red maple. Changing dam operations will reduce flood times and allow oaks and other hardwoods to flourish, which is good news for property owners along the river. More Time on the River and in Forests of the Floodplain – Current operations, with their high water levels, block access to the floodplain for long periods of time. Changing the dam operations will give anglers, hunters and outdoor enthusiasts more time to enjoy the area. That’s good news for recreational users of the river; it is also good for the many businesses that cater to recreational users. More Food for Wildlife – As oak trees disappear so do their acorns, which are a major source of food for deer, squirrels and other wildlife. Changing the dam operations will keep the acorns dropping and ensure continued abundance of wildlife, which is good news for hunters and wildlife enthusiasts. Improved Water Quality – Holding large amounts of water behind dams or in the downstream floodplain for long periods of time leads to lower levels of oxygen in the water. The fish and other animals are hurt, particularly in hot summer months. Changing the dam operations will improve oxygen in the water – reducing fish kills and ensuring that fish thrive in the Roanoke, which is good news for anglers. Reducing Erosion – Long periods of flooding lead to banks eroding and collapsing. Changing dam operations will reduce shoreline erosion on the river and in the Reservoir, which is good news for property owners. 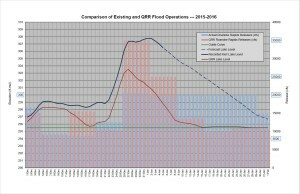 Increasing Flood Storage – Current operations result in sustained high reservoir levels, reducing capacity for storage of additional storm events. Kerr lake Park Watch is working right up to Friday’s deadline to get its members and the public to support the adoption of the QRR Plan by the U S Army Corps of Engineers. 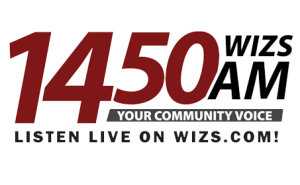 Kerr Lake Park Watch public affairs lead, Frank Timberlake appeared on Henderson radio station WIZS’s TOWN TALK this morning urging people to send just a short email to the Corps. The urgency is that this is the last week to make comments that count in the Corps’s official record of the 216 or water administration plan for Kerr Lake. THIS IS THE LAST WEEK TO MAKE COMMENTS TO CORPS. Kerr Lake Park Watch wants to help Kerr Lake sustain more consistent levels to help recreation and tourism and is asking its members and interested citizens around the lake and those who visit Kerr Lake to take a few minutes to help for years. 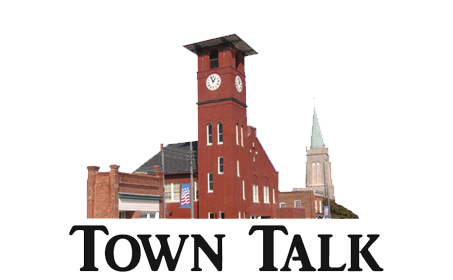 “It’s just a few minutes to write an email that can help so many aspects of Kerr Lake, its residents and its visitors, said, Kerr Lake Park Watch spokesman, Frank Timberlake. “You need to write to the U S Army Corps of Engineers in support of adopting the QRR plan during the last days of the comment period. QRR is simply, Quasi-Run-of-River, which means letting the water flow downstream more naturally than holding it up. The time to enter public comment about QRR being adopted by the Corps, is now as the last date in the comment period is Friday, January 29th. Late 2015 and early 2016 have seen a number of flood days on both local Kerr Lake roads and public areas. 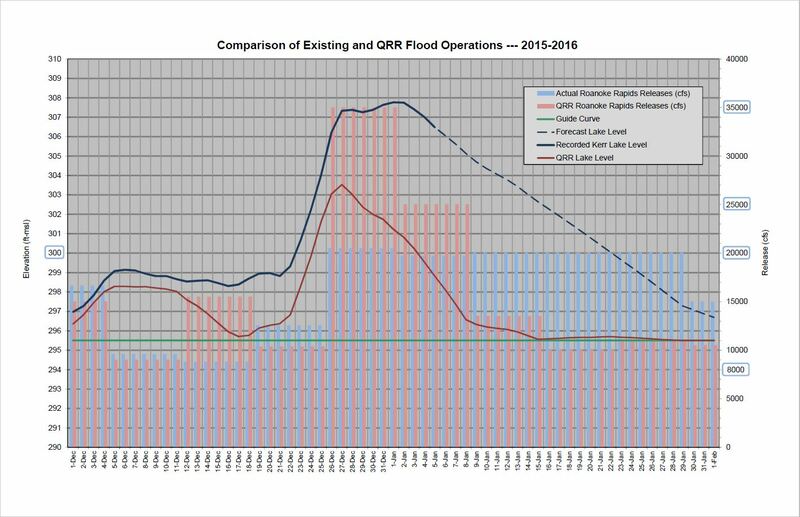 A Comparison of Existing and QRR Flood Operations — 2015-2016 which is plot graphic provided by Ashley Hatchell of the Water Management section of the Corps of Engineers, clearly shows the advantages of the QRR plan. The only disadvantages of QRR would be what power companies call “water spillage” which means water that moves through the system freely without having generated hydroelectric power.